1. I ran a half marathon the day before and gave it my very best; my legs were toast. 2. Wake up was at 4 a.m.
3. It was my birthday and I was basking in the glory of graceful aging. 4. Maybe I had a couple of beers the night before, too. None of this matters much because I signed up for this race with the one and only purpose of having fun. I love running, I love running races even more — especially when HusbandRuns comes along. What better way to start off a birthday? After so many years in the Bay Area I still don’t know parts of San Francisco enough to be able to tell you about the course in much detail. 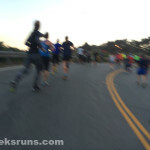 So instead of pretending to be the RnRSF expert, let me give you the quick rundown of what I remember best about this race. I hope it’s at least a bit useful. 1. The race starts at 6:30 a.m. So unless you are traveling from very far out of town and have no other choice, you’d have to decide between springing $$$$$ for a hotel in the city or waking up at 4 a.m. The course is point-to-point and there are shuttles picking up runners from Civic Center (the Finish area) to take them to the start. The last shuttle was listed as leaving at 5:30 a.m. Either go in one of the many available near the shuttle pick-up area, or plan to go on the beach near the start. Or both. There were 15 corrals this year, each starting a few minutes apart. 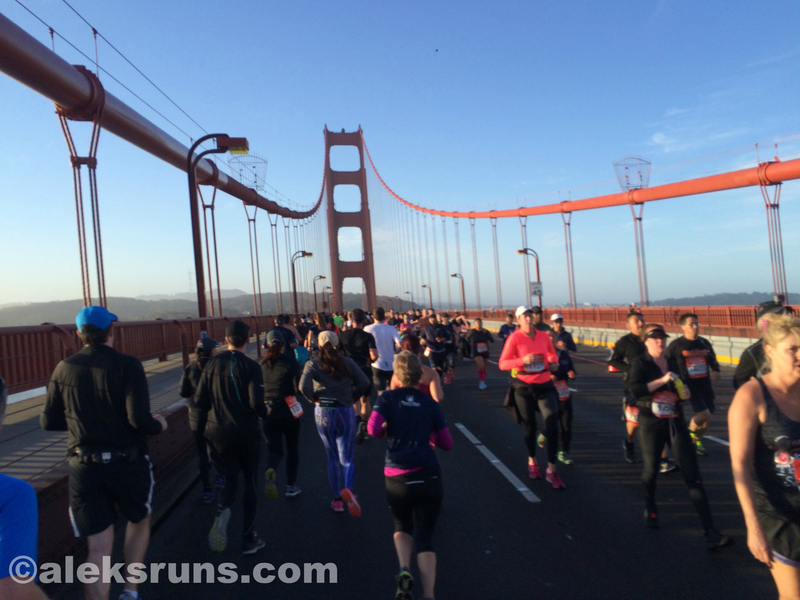 Even then, the first mile felt packed and so did running over the Golden Gate Bridge. There were nearly 7,000 runners in the 2015 event — up from roughly 5,000 (if I remember correctly) in 2013, the first year Rock ‘n’ Roll took over the even from the US Half. The course was different back then, but I was in the same corral (#2) and we had definitely spread out more by the time we had to run over the bridge. 4. You’ll run ALL of the hills! There are five big climbs (200 ft or more each): the first one is in the beginning, the last one towards the end. The middle one is up and over the Golden Gate bridge, that one is at least fun! Thankfully, you don’t have to go down on the Marin side of the Bridge and climb back up, just go around Vista Point. Perfect for picture-taking. Speaking of picture-taking and hills… You might as well mark this race as one to run at a comfortable pace and allow yourself to stop and digitize as often as you’d like. The course is hilly, crowded and (parts of it are) too pretty to waste on an all-out-must-PR effort. 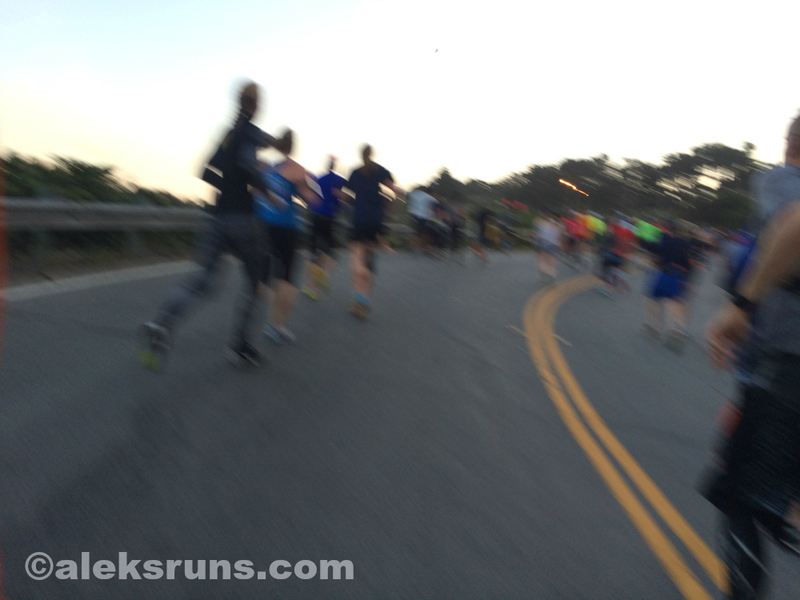 Good times at #RnRSF today! Killer hills on tired legs and fabulous views! We kept a fairly even 9:30-9:45-ish pace the whole way and made it to the finish after 2:07:54. Not my slowest half and not my best — but a great start to a new day and year of running for this ol’ lady. Cheers! Clock time (Corral 2): 2:12:12 –> lucky, huh? But note nearly a five-minute difference from gun time; I’d expect a similar delay for each following corral.